Sulfuric acid is a strong inorganic acid commonly used in the industrial production of chemicals, in research work and in the laboratory setting. It has the molecular formula H2SO4. 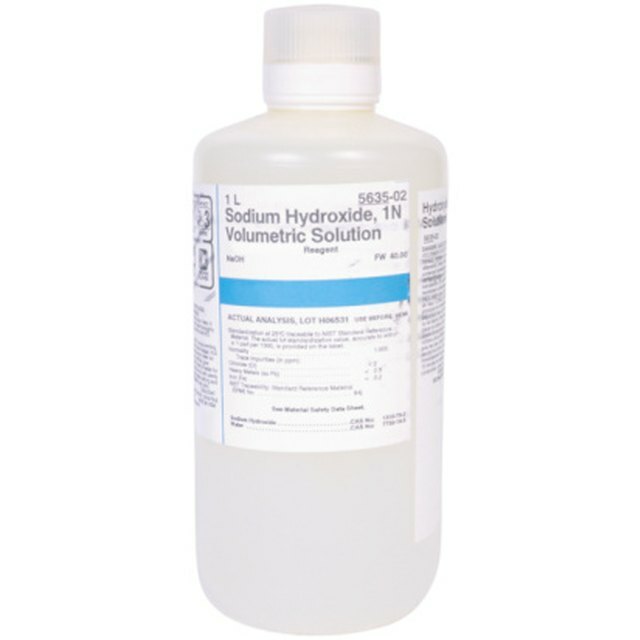 It is soluble in water at all concentrations to form a sulfuric acid solution. 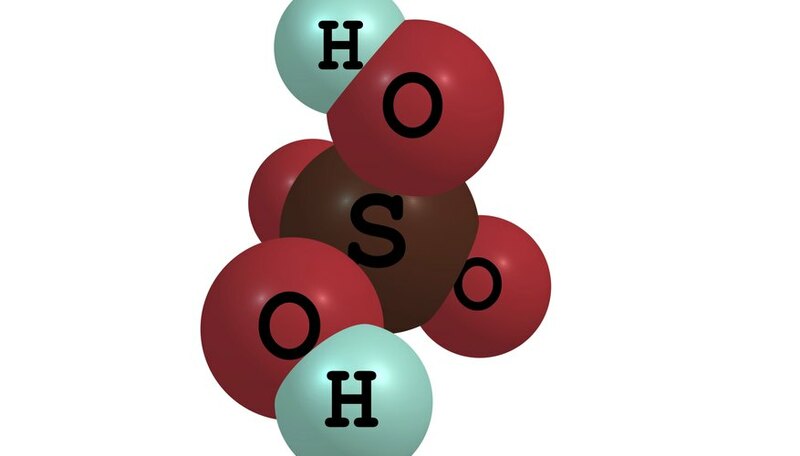 In the solution, a mole of sulfuric acid separates into a mole of negatively charged sulfate ions, or SO4(2-), and 2 moles of positively charged hydronium ions, or H3O+. The concentration of these ions is expressed in molarity, which is defined as the number of moles of ions per liter of solution. Their concentration depends on the initial concentration of sulfuric acid. Write out the balanced equation for the dissolution, or dissociation, of sulfuric acid in water. The balanced equation should be: H2SO4 + 2H2O -> 2H3O+ + SO4(2-). The equation shows that for the dissolution of one mole of sulfuric acid in water, 2 moles of hydronium ions and 1 mole of sulfate ions are produced in the reaction. For a solution of sulfuric acid with an initial concentration of 0.01 moles, this means that there are 0.01 moles of sulfuric acid in 1 liter of solution. Multiply the initial acid concentrations by their coefficients to determine the individual concentrations of the ions. The coefficients are the numbers before the formulas in the balanced chemical equation. Formulas without numbers before them have a coefficient of 1. This would mean that the initial acid concentration is multiplied by 1 to determine the molarity of sulfate ions in solution; 1 x 0.01 mole = 0.01 mole SO4(2-). The initial concentration is multiplied by 2 to determine the concentration of hydronium ions in solution; 2 x 0.01 mole = 0.02 mole H3O+. Multiply the initial acid concentration by 3 to determine the total ionic concentration of the 0.01-mole sulfuric acid solution. Since one mole of the acid produces a total of 3 moles of ions, the total ionic concentration is 3 x 0.01 moles = 0.03 moles of ions. 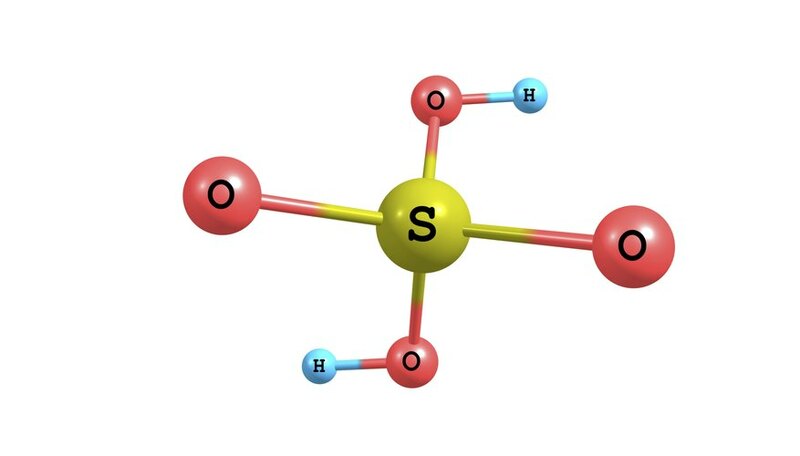 The assumption that sulfuric acid completely dissolves in water is valid because sulfuric acid is a strong acid and complete dissolution in water is a characteristic of strong acids. Additional steps are needed to compute the concentration of ions in solution for a weak acid. Always follow safety procedures in the laboratory or at any time when handling acids. This includes the use of safety equipment such as laboratory gowns, goggles, gloves and appropriate glassware. Suico, Joshua. " How to Calculate the Concentration of Ions in a 0.010 Aqueous Solution of Sulfuric Acid." Sciencing, https://sciencing.com/calculate-aqueous-solution-sulfuric-acid-8507619.html. 25 April 2017.